Many online casinos have been established as an Internet version of Las Vegas style casinos – but not Thrills. This Web and mobile casino offers a unique and exciting visual layout which looks more like a games arcade than a casino – targeting a whole new crowd of players. Thrills has been in operation since 2013 and has quickly made a name for itself thanks to the inclusion of popular software providers such as Net Entertainment, Microgaming, BetSoft, and many more, creating a 600+ gaming catalogue, including some of our favourite real money card games. Note: This review is intended for our international readers only. Thrills Casino does not accept Australian players and Australians cannot gamble online as of September 2017 due to the Interactive Gambling Amendment Bill 2016 coming into full legal effect. When you follow our links to www.Thrills.com, you will be prompted to sign up and once you’re all logged in you will be able to view the huge library of card games available from a variety of software developers. You will find the card games under the ‘Classics Category’ with each offering an array of standard and unique variants. 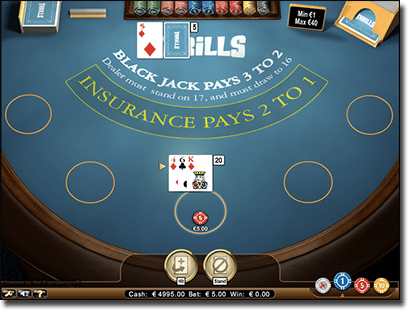 Additionally, an unusual but welcome feature to Thrills which you won’t find at any other online casino allows you to play more than one game at once in the same window. Simply click on the small two game icon or four game icon in the bottom right hand corner to add up to three additional games to play in the one window. If you’re a good multi-tasker, this is perfect to run a few games of 21 and poker at the same time. 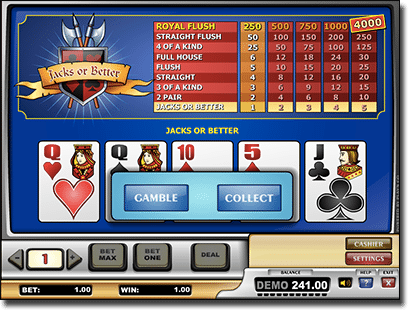 There are around 28 blackjack titles available at Thrills, each from a multitude of software developers, including traditional titles such as Classic Blackjack by Net Entertainment, and unique titles such as Atlantic City Blackjack Gold by Microgaming, with table limits to suit every player. Thrills has an incredible video poker catalogue, and with an incredibly low house edge attached to the games you can’t go wrong. There are over 42 titles at Thrills Casino which combine the strategy of card games with the ease of slot machines. 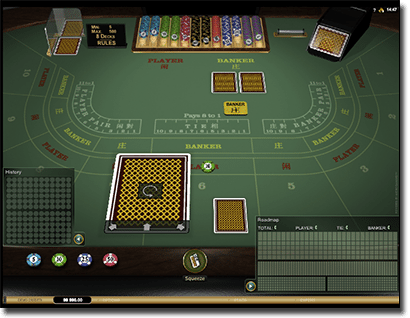 There are also an array of poker variants available under the subcategory of ‘Other Table Games’, where you can also find a Craps title and unique game variants, such as Red Dog and Triple Chance Hi-Lo. There are around 12 roulette titles available at Thrills casino, also located under the ‘Classics’ category, as well as an array of other real money casino titles including an extensive range of slots, found under the ‘Slots’ category, as well as progressives located under the ‘Jackpot’ category. Modern video slots we recommend checking out include Nirvana from Yggdrasil, Pyramid Quest for Immortality by Net Entertainment, and Game of Thrones by Microgaming. Popular progressives we advise trying out if you want a break from card games include Net Entertainment’s Mega Fortune and Microgaming’s Mega Moolah. You will also find arcade games and scratch games under the ‘Other Games’ category. The best part about online casinos, which employ multiple software developers, is new additions are nearly always being added, so at Thrills it is likely you will find something new each week. In order to get playing the card games available at Thrills you will need to sign up and make a deposit. You can do this by following our links and registering your details. Since the site is encrypted your personal details are secure, while your financial details are too. Additionally, Thrills is governed by the Malta Gaming Authority meaning all games are fair and the site has a great transaction record. 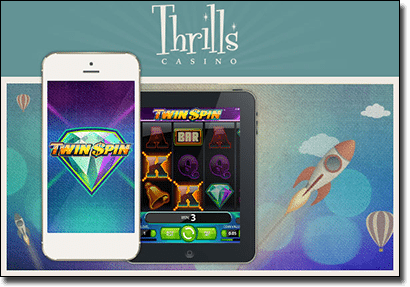 Since Thrills is an instant play casino there is no need to download any software to access the site – you can play via any web browser including Firefox, Safari and Chrome – perfect for Mac users and devices with limited storage. Once you have registered an account you can make a deposit using an array of trusted payment options, including Visa, MasterCard, Paysafecard, Neteller, and Skrill. Here you can also opt in for the new player bonus of $500 in matched deposits as well as 100 free spins on Net Entertainment’s popular slot Starburst. So it is possible to clear the wagering requirements via card games at Thrills casino, though the slots are the quickest way to do it. Thrills offer a mobile compatible site for Apple, Android, Windows, and Blackberry users. So if you have a smartphone or tablet you will most likely be able to access the array of mobile titles available, including a wide selection of card games such as blackjack, mini baccarat, video poker and more. There are quite a large range of easy payment methods as we mentioned above, including credit and debit cards, e-Wallets, and pre-paid cards. Deposits are cleared immediately and charged to your personal account – bank or e-Wallet account – within 24 hours. Visa and e-Wallets are the only possible methods to make a withdrawal and processing times can take up to 72 hours to clear. Thrills offer a help desk in order to resolve any issues you may be having, regardless where in the world you are playing. However, the live chat is only available from 8:00PM – 10:00AM AEDT meaning you may not always get immediate help. Players can also email [email protected] or phone +44 800 011 9572 between these hours to get a quick response or outside these hours expect a reply within 24 hours. Register at www.Thrills.com by clicking any of our links to check out a wide variety of online real money card games, of which you can play more than two at a time thanks to Thrills’ unique multi-screen feature.